This is a map showing attempted invasions of England and Ireland from 1066 to 1797. Each invasion is represented by one or more ships offshore, numbered, and described in detail in an accompanying French-language pamphlet. The map is signed by "P.F. Tardieu," a signature often used by Antoine-Francois Tardieu "in honour of his uncle, Pierre-Francois." French 2004, v.Q-Z, 248. Maps of this subject date to John Speed's "Invasions of England and Ireland with al their Civill Wars Since the Conquest," first published in 1627 (Shirley 1991, #397). A version first published on September 15, 1797, by Laurie & Whittle in London brought Speed's work current to 1745. Tardieu's map appears to be an exact copy - including the hand coloring - of the Laurie & Whittle map, with several later invasions added. Compare http://www.davidrumsey.com, List No. 2310.012. But the history only deepens the mystery surrounding Tardieu's map and the pamphlet: Why was this work published at this time, in French, and illustrated by a French cartographer? The pamphlet is dated "An VI," year six of the French Revolution, so it was produced sometime in the year beginning September 22, 1797. The Treaty of Campo Formio in October 1797 marked the successful end of the Italian and Austrian campaigns, and Napoleon returned to Paris at the peak of his popularity with England the nation's only major surviving enemy. The Directory had already commenced plans for the invasion of England and was building an "Army of England." In February 1798, Napoleon toured the coast where the invasion planning was under way and concluded that it was not possible to move the necessary barges of men and equipment across the Channel in light of British naval superiority. Instead, Napoleon persuaded the Directory to endorse an objective that had long interested him: from the French ports on the Mediterranean, to attack Egypt (and eventually threaten Britain's vital colony in India) (Dwyer 2008, 333-340|Strathern 2009, 30-32). Secrecy was essential to Napoleon's plan|there were no British warships in the Mediterranean at the time, and the objective was to keep the British fleet defending the home islands until the invasion of Egypt was launched. Indeed, not even the French Minister of War knew the real objective of the Army of England (Dwyer 337|Strathern 42-43). The question is whether the pamphlet and the map may have been produced as part of the (successful) effort to deceive the British. The introduction states that the pamphlet was written to reassure French citizens who "doubt the possibility of landing in England, that to doubt is almost like refusing the evidence of probability." To that end, the text describes each of 45 selected historic landings and concludes (with some license) that 41 were "successful" and that 12 had "caused great revolutions or dethroned the ruling king." The stated reason for the pamphlet seems weak|the literature doesn't suggest a substantial need to convince French citizens to invade England - or to support Napoleon in whatever military action he pursued in 1798. Although the pamphlet is anonymous, BNF (and others) attribute it to Stanislas de Girardan, a close aid and long-time confidant of Napoleon (http://catalogue.bnf.fr/servlet/biblio?idNoeud=1&ID=36447013&SN1=0&SN2=0&host=catalogue, accessed January 21, 2015). If the pamphlet had been written before the invasion of England was abandoned, it seems unlikely that Girardan would have been selected to write it. And if it was written after the decision to invade Egypt, he was close enough to Napoleon to have participated knowingly in an effort to deceive. The pamphlet's introduction closes with a threat to the home islands: "If the British Minister does not hurry to accept the conditions that our continental position gives us the right to propose to him, our republican army shall soon install the tricolor flag on the Tower of London . . . and shall punish and destroy the most Machiavellian of Governments." 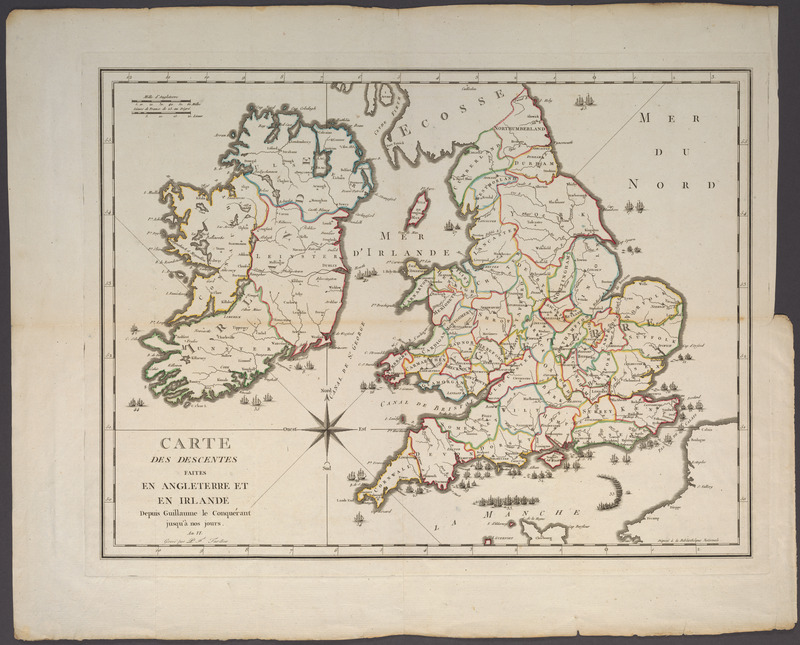 Whatever the intent and impact of the map and pamphlet, there was in 1798 a "national anxiety" among the British about landings in England and Ireland: "For many months, the designs of the Directory occasioned serious perturbation to the British Government, awakening the fear of the country at large." (Wheeler 1908, 1:104). The French fleet set sail for Egypt in May 1798 unimpeded and played a successful game of hide and seek with Nelson through June and July while Napoleon's troops captured Cairo and Alexandria. In the end, Nelson caught up with the French fleet on August 1 and virtually destroyed it at the Battle of Aboukir Bay (confirming Napoleon's view of British sea power). After a brief flurry in the Holy Land, Napoleon returned to France in 1799 on one of his few surviving frigates. For a similar English map apparently intended to warn of a possible French invasion in 1803, see ID #1031, Russell, Chart of the British Channel. Girardin, Stanislas. An VI [year six of the French revolution]. Notice historique des descentes qui ont été faites dans les isles britanniques depuis Guillaume-le-conquérant jusqu'à l'an VI de la République française, Avec une carte enluminée, gravée par P. Tardieu. Paris: Crarpelet.